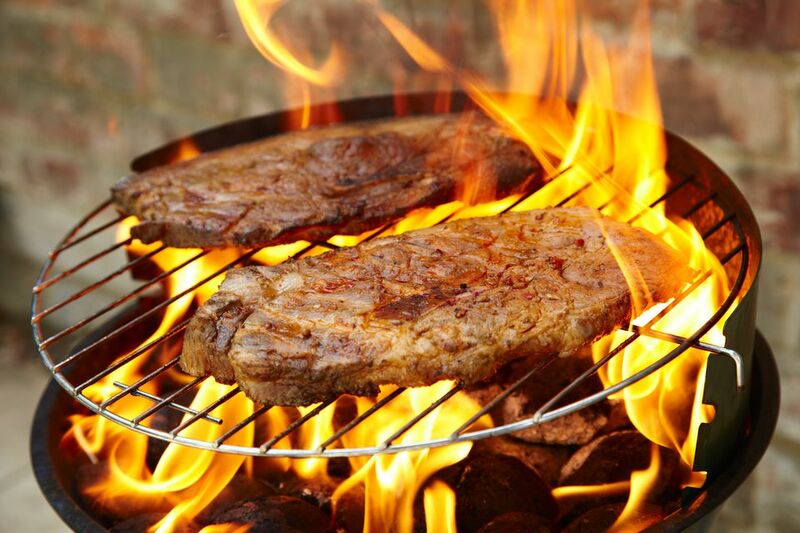 Developed in Saarland (southwest Germany, borders France) and adopted all over Germany where regulations allow, the "Schwenker" is a pork steak marinated for at least 24 hours and grilled over a wood fire. The "Schwenker" is also the person who does the "schwenken" (swinging), as the grill swings gently over a wood fire using a metal tripod. This takes 20 minutes to put together and an 8 to 24 hour marinade time, plus 20 minutes to grill. If you cannot find pork steaks already cut, buy a whole pork shoulder roast (or similar roast), debone it, and cut the meat crosswise, 1/2 to 3/4 inches thick to make steaks. Mix the oil with the garlic, mustard and the rest of the spices in a large bowl, add the steaks and the onions and turn to coat. Layer all the meat and the onions in the bowl, cover with plastic wrap or foil and refrigerate for 8 to 24 hours, mixing a few times to redistribute the oil. You may want to put it all in a plastic zip bag after mixing, expel all the air, and close it tight. To stir, flip the bag over. This also travels well to a grill site. Remove meat from the refrigerator about 1/2 hour before grilling (to take the chill off). Place schnitzel (without onions) in a single layer over direct heat, salt (a little) and grill for 8 to 10 minutes per side. Traditionally, these are grilled over beechwood fires. You may also use charcoal or gas.